Give mum the full royal treatment this Mother`s Day and send her our lux flower arrangement in tones of pretty purple and pink. This divine gift for mum features a gorgeous combination of pink roses, fluffy pastel chyrsanthemums, blush pink Singapore orchids and perfect purple carnations. 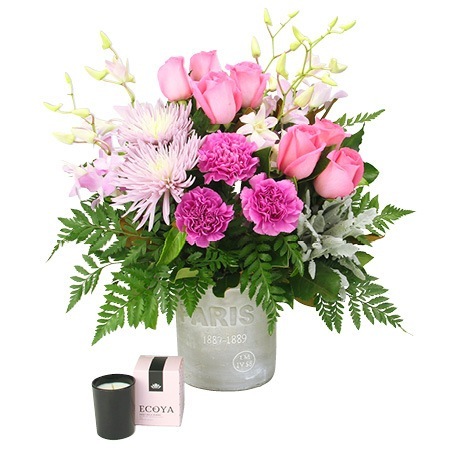 Designed by our professional florist team in a vintage-look white `Paris` pot with fresh green and silver foliage, and delivered with a FREE ECOYA CANDLE worth $24.95, we are positive mum will just love her gift! Send your mum the royal treatment this Mother`s Day and order these beautiful purple and pink flowers online, email our floral consultants directly at sales@flowersforeveryone.com.au or phone 1800 66 66 46. *Please Note: The pictured Mothers Day flowers are available for delivery in Sydney, Melbourne, Perth, Brisbane and Canberra metro regions only.